The San Francisco real estate market continues to experience strong buyer demand and an exceptionally low number of homes and condos for sale. The strong demand is supported by a clean sweep of positive economic indicators just posted by The Conference Board, which reported that consumer confidence is at a 15 year high, and the Leading Economic Index, CEO Confidence, Help-Wanted Online, and the Employment Trends Index all rose in February. Following the incredibly strong Snap IPO, Mulesoft, a San Francisco unicorn, filed for its IPO in February. This San Francisco-based company has over 700 employees who will be armed with a lot of cash following its IPO, anticipated later this year, which could further add to the number of buyers competing for properties. Federal Reserve Bank has said it is likely to raise its federal funds rate in March, with a second increase anticipated later in the year. These anticipated rate increases have already triggered a jump in mortgage rates, which now stand at 4.24% according to Mortgage News Daily. 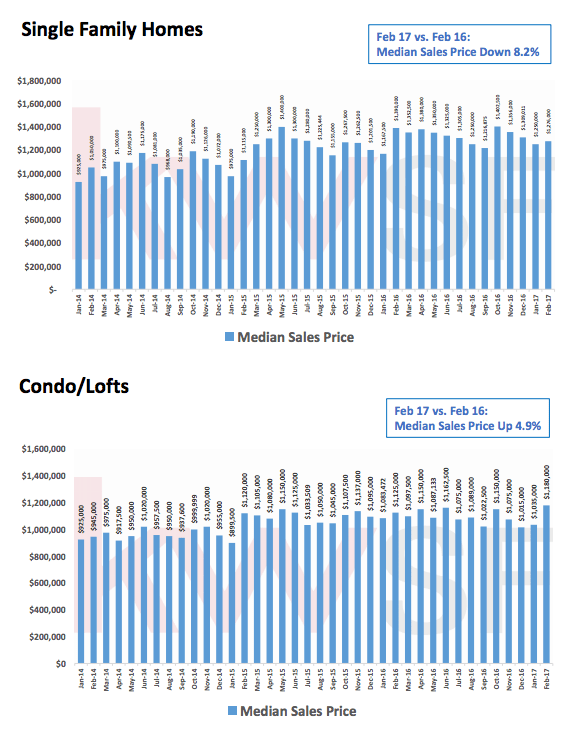 On the following charts we see that the San Francisco single family home market dipped in median sales price, down 8.2% year-on-year. The number of sales were up 3.9%. 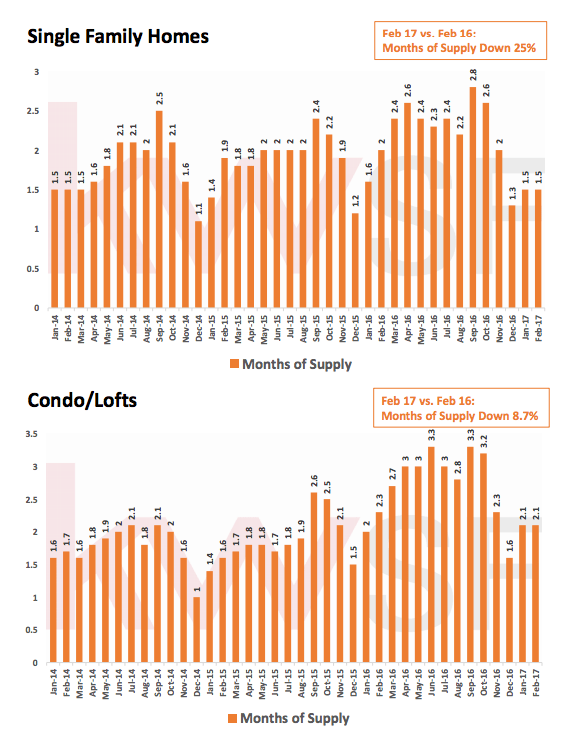 The number of new listings dropped sharply, 37.6% fewer than last February, leading to a 10% drop in inventory to just 1.5 months of supply. 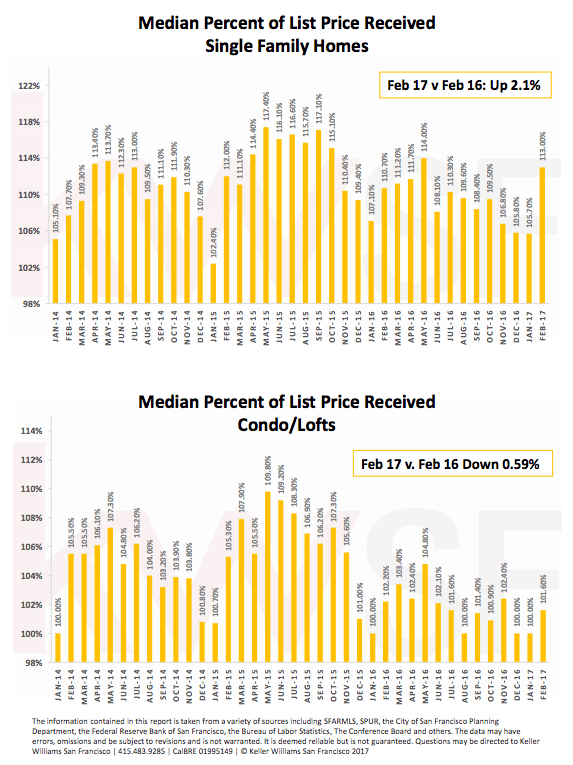 The median sales price of single family homes also continues to be bid up above list price, coming in at 113% for February. 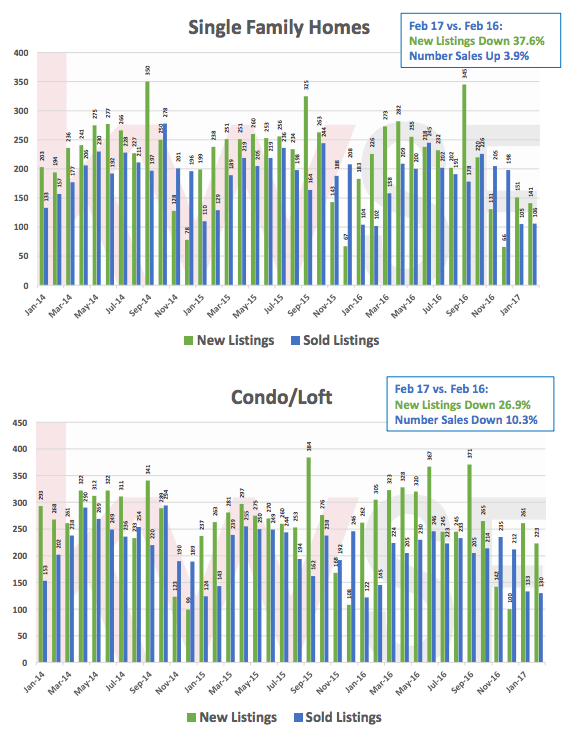 The news in condo/lofts sales is the sharp decline in the number of new listings in February, down 26.9% compared to last year. Sales were also down, but just by 10.3%. Inventory stands at only 2.1 months of supply. Median sales prices are up 4.9% year-onyear with the median price going 1.6% above list price.